I’ll admit it – initial wedding planning was stressful. Deciding on the guest list size, budget, and venue took a lot of focus and energy. In part because it required a great deal of research to know our options, along with coordination between the many people involved, and in part because these are big decisions that no one wants to regret. Happily, my fiancé and I feel great about the direction we ended up taking. We are now deep into the really fun choices, such as music, flowers, and menus. 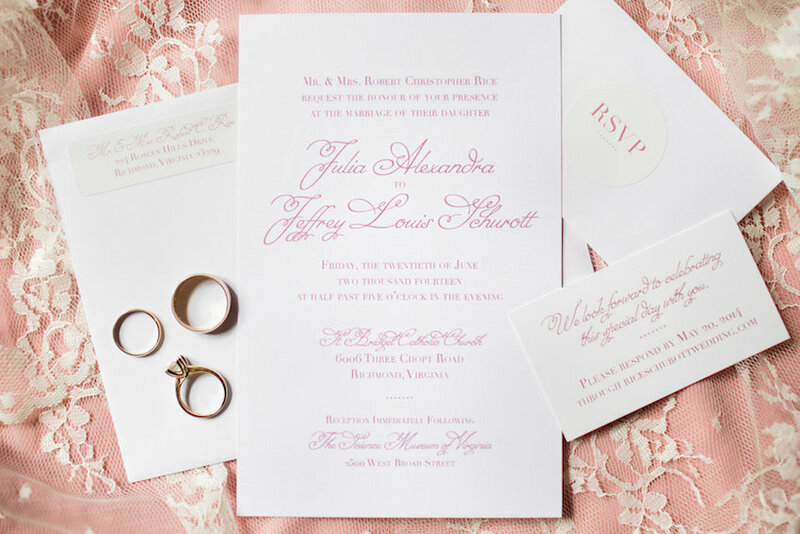 Since I love all things printed, the invitations are one of my favorite parts of any wedding. Most pressing at the moment is our invitation design and wording, both of which require more thought than couples may at first realize. Like wedding dresses, most wedding invitations need to be ordered well in advance of the big day. On average, count back eight to ten weeks from the wedding date to determine your mailing date. Now count back two weeks before that: this is the date you want your invitations to be delivered to you. (You’ll use those two weeks to assemble, stuff, and address the envelopes.) Depending on the invitations you choose, you may need to begin the ordering process three months prior to the delivery date to allow for selection, proofing, approval, printing, and delivery. Timetables will vary by supplier, but knowing both your delivery date and mailing date will be key to ensuring you have enough time to mail your invitations well in advance of the wedding. Wording choice will reflect the formality of your wedding, as well as your personality. “Mr. and Mrs. Peter L. Post request the honour of your presence...” sets a different tone than “With joy in their hearts, Anna and Matt hope you will join them…” There is no right or wrong choice in terms of etiquette. Just be sure that all of the important information is there: the names of the couple getting married, the host(s) (if different), the date and time, location, any reception information, contact information, and an RSVP deadline. What should not appear: registry information. This is spread by word of mouth or via the couple’s wedding website. In addition, the return address on the wedding invitation indicates where gifts and replies should be sent, usually the host’s address. It may also be the couple’s, even if they aren’t paying, to avoid having to re-ship gifts if they don’t live near the hosting parents. Traditionally, the bride’s parents hosted the wedding and were represented as such on the invitation. Today, many couples pay for part or all of their weddings, or do so with help from the groom’s parents, too. Divorced parents and any new spouses can also add to the potential number of hosts mentioned on the invitation. While I can’t list all of the examples here, know that there are several ways to word all kinds of family scenarios, from divorced, to deceased parents, to hosts who aren’t the couples’ parents. It’s also fine to include parents who aren’t financing the celebration in any way as “honorary” hosts. Alternately, I am a big fan of the phrasing, “Together with their families/[bride]/and/[groom]/request the pleasure of your company [or similar]...” This includes everyone equally and keeps the focus on the couple. It can also help to avoid any feelings of resentment if there is animosity between parents or if the bride or groom has complicated parental relationships. For such a personal and important invitation as a wedding invitation, addressing the envelopes by hand is preferred. This can take quite a bit of time – hence the aforementioned two-week window between the invitation delivery and mailing dates to accomplish this task. Any neat handwriting is acceptable, though if ever there was a time to hire a calligrapher, this is it. Start talking to calligraphers a month or two in advance of your delivery date to check their availability and confirm how much time they request for the task. The beauty and precision of professional calligraphy makes quite a statement and saves the couple hours of work (and hand cramps)! Whether the addressing is outsourced or done at home, whoever is doing the work will need to have up-to-date addresses and names of all guests, including any children. Most wedding invitations are formally addressed, so be prepared to find out some details, such as middle initials and any professional titles. It’s okay to call or email guests for this information; it won’t preempt the invitation to come. Nothing can take away from the pleasure of opening your mailbox, pulling out a heavy envelope of fine paper, and seeing your name beautifully written out. If a wedding invitation is about setting the stage for the wedding, there’s no better start than that.